Wanderers gained a valuable point with a draw against Shamrock Rivers, but will undoubtedly be disappointed that they couldn’t hold out for all three. The home side went into the break ahead, courtesy of a neat piece of cooperation between winger Dylan Connolly and substitute Ger Pender. But both managers’ plans were damaged by a series of injuries that saw half the available substitutions made before half time. And midway through the second period a handball in the area by Bray skipper Conor Kenna gave the visitors an opportunity to equalise. Former Seagull Gary McCabe did the needful from the spot. Despite the best efforts of both sides the scoreboard remained stubbornly unchanged from then on. 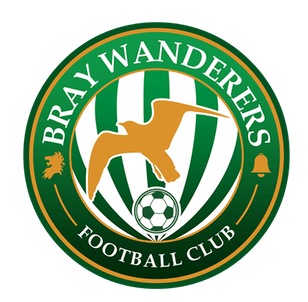 Bray made their intention clear early on, with John O’Sullivan pumping forward for Connolly, who got into the Hoops’ defence only to see the ball out for a goal kick after a Bray throw. Brandon Miele began as he would continue, his vigorous challenge on Kevin Lynch earning the home side a few while his subsequent foul on Kenna went unnoticed. Just before the ten minute mark, Ryan Brennan threw himself forward in the effort to reach Connelly’s cross and crunched into Craig Hyland’s right-handed post ribs first. The youngest of the Brennans tried to resume after treatment, but by the quarter hour he was forced to quit, the first of an unusual three substitutions made inside thirty minutes. From the next move, Connolly attempted a diving header at a self-centred cross, but Hyland was ready, and though Hugh Douglas had placed himself precisely level with the defence waiting for a long cross minutes later, the ball when it came was much too long. Dean Kelly pulled the trigger on a lively shot which then rebounded off a defender; strangely, though, it as the Bray man who went to ground, needed attention and finally had to leave he fray. Douglas was receiving more than his share of attention from the visitors, and Peter Cherrie was alert to claim a Simon Madden cross. Though there was little to choose between the sides up to this, it could be argued that the opening score was slightly against the play. A signature run by Connolly seemed to have ended when he was bundled over by Madden in the area, but he managed to release the ball to Pender whose shot was blocked. By that stage, however, Connolly was back in his feet and returned the ball to the youngster who responded with the second leg of a one-two, and the lively Bray winger didn’t need an invitation to fill the empty net. Thereafter, Killian became the second Brennan brother to leave the field, why was not immediately clear. Just after the half-hour, Rob Cornwall bot the only car if the evening for disputing a free awarded for a foul on Rovers’ second Most-Wanted, Connolly. Pender tried an ambitious 22m waist-high shot, but it hasn’t enough to trouble Hyland. The visitors seemed to be relying a lot on the counter-attack, but loose play in possession blunted many of them. Two minutes before the break, a Miele free wide on the left was dipping nicely towards Cherrie’s crossbar until Cornwall glanced it over. Cherrie got down well to smother Dean Clarke’s shot as Anthony Buttimer got ready to blow the whistle. On the resumption, Douglas was back at his day-job in defence, working well at the end line to prevent the visitors claiming a corner, but okay degenerated into series of end-to-end raids featuring ping-pong headwork and pushing on both sides, some of which was penalised and some not. As the hour turned, a Moore ball for Pender was just too long, and at the end of another good attack a horrible ball spoiled it all. The ensuing period saw the Seagulls largely on the defensive, Kenna, Clancy, Douglas and Cherrie in particular working well together until an unavoidable bell-to-arm, Kenna in the way of Miele’s shot, saw Buttimer discard Michelle O’Neill’s indication of a corner and point to the spot – though his cards remained untouched. Former Seagull Gary McCabe stepped up and sent Cherrie the wrong way, and a lead few on the Bray side had expected vanished. Now it was a battle to save the single point on the home side, and a struggle to claim all three on the part of Shamrock Rovers. With ten minutes to go, Clarke was down in the Bray area, but calls for another penalty went unheeded. Bray in attack benefitted from frees derived from desperate defending, but Moore’s eventual corner was well-placed. An offside flag against Pender sense debatable – not the first such on either side – and when O’Neill gave an unexpected corner to the visitors, it was taken short and eventually put wide. Considering the situation, the renewed loose play by Rovers midfield was surprising, and the home side might have nicked a win when final substitute Gareth McDonagh was narrowly wide after good play in time added. A result most Bray fans would have grabbed before the start finally felt like a loss.